Gibson, Dunn, & Crutcher Partner Eduardo Gallardo ’99 and New York Court of Appeals Associate Judge Jenny Rivera ’93 received Distinguished Alumni Awards. 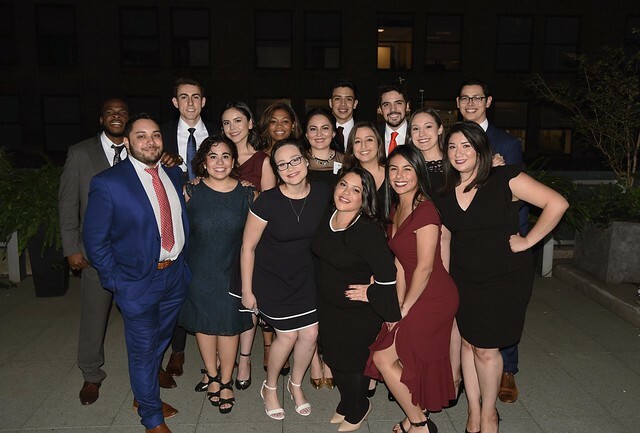 The Columbia Law School Latino/a Law Students Association (CLS LaLSA) celebrated the accomplishments of students and alumni at its 14th Annual Awards Banquet at the Princeton Club on October 19, 2018. LaLSA presented Distinguished Alumni Awards to Eduardo Gallardo ’99, partner at Gibson, Dunn, & Crutcher, and New York Court of Appeals Associate Judge Jenny Rivera ’93. The Rising Star Award was presented to Adriana Garcia ’12, policy advisor for the N.Y.C. Mayor's Office of Immigrant Affairs. LaLSA’s mission is to promote understanding of the Latino community by sponsoring academic, professional, cultural, social, and community service activities for its members as well as Columbia Law School's general student body. LaLSA serves as a liaison between Latino/a students and the Columbia Law School administration, the general student body, alumni, and other professionals in the legal field.